The lively spirit of three distinct countries infuses this perennially popular exploration of Central Europe. Discover this fascinating variety as you spin from the castle towns and hushed forests of the Czech Republic to charming German villages and some of the most scenic landscapes of Austria. 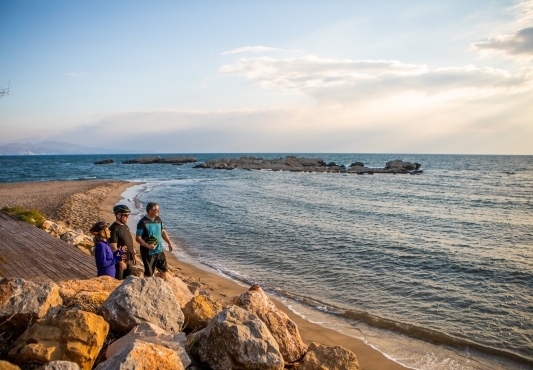 Medieval fortresses, abbeys, cathedrals, vineyards and serene national parks unfold before you as you choose the perfect balance of discovery by bicycle, boat and foot. 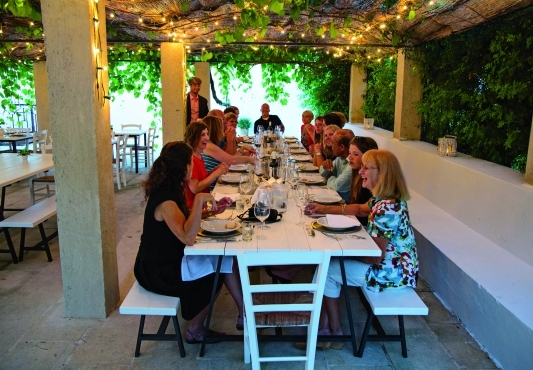 And get acquainted with the locals in a Bavarian beer garden, at a private home and more. 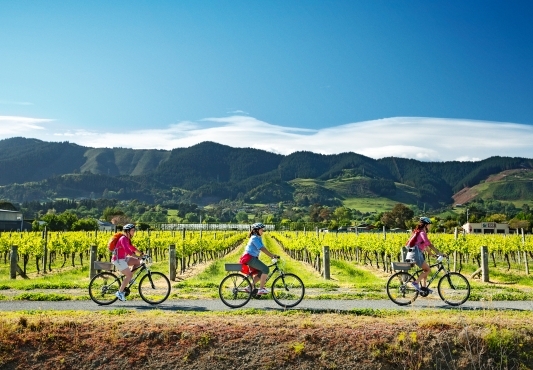 This tour offers easy terrain throughout the trip and is ideal for beginning cyclists. Our VBT support shuttle is available every day at designated points for those who need assistance. Discover Cesky Krumlov, a Bohemian town brimming with medieval authenticity. Sit down to lunch with a local family, for an authentic taste of everyday Czech life. Cross into Germany via a unique border crossing for pedestrians and bicycles only. Enter the spirit of Bavaria over lunch at a typical beer garden. Picnic on the banks of the River Inn, with views of mighty Neuburg fortress overhead. 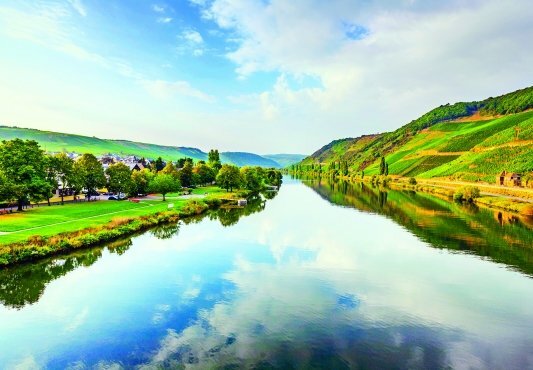 Marvel at the stunning views as you cruise through Austria's famous Schlögener Schlinge. Spin through the Wachau Valley, a UNESCO-designated landscape of hillside orchards, vineyards, ruined castles, abbeys and churches. Upon leaving customs, enter the arrival hall and look for your VBT representative, who will be holding a VBT sign. Your representative welcomes you to Prague and helps you transfer via taxi or van (approximately 30 minutes, depending upon traffic) to your Prague hotel. (Note: At this time, please verify with your VBT representative the time of your transfer from your Vienna hotel to the Vienna airport at the end of your trip.) If your VBT representative is not immediately in sight, there is a “Meeting Point Column” just outside of the Arrivals gate. Please wait there, as the VBT representative may be transferring with an earlier arrival. They should arrive within 30 minutes of your scheduled arrival. At 8:30 a.m., all guests meet the VBT representative at the hotel in Prague, the Mamaison Hotel Riverside Prague (address: Janáckovo nábreží 15, Prague 5; tel: +420 225 994 611), and transfer to Cesky Krumlov in the south of the Czech Republic (approximately 3½ hours, including a stop on the way). Cesky Krumlov is a unique town in Bohemia, built at a curve of the River Vltava and dripping with medieval authenticity. Its historic center has been a UNESCO World Heritage Site since 1992. You’ll arrive at approximately 12:00 p.m. Meet your Trip Leaders, who provide a quick introduction to the day’s schedule and the town, providing recommendations for lunch on your own. 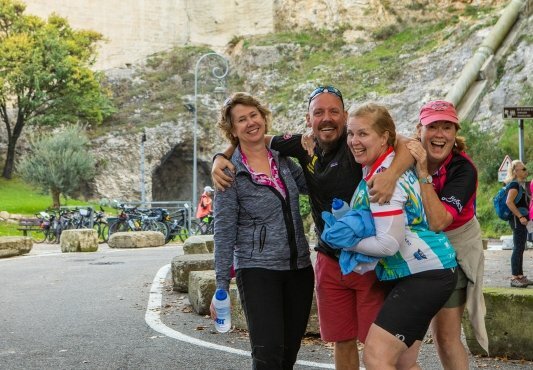 At 3:00 p.m., return to the hotel and join your Trip Leaders for a safety and bike-fitting session, followed by a warm-up ride through town and into the countryside. Later, gather with the group for a welcome cocktail reception and dinner at your hotel’s restaurant. After breakfast, meet our local guide, Standa, and follow him on a short walking tour and introduction to Czech life. Then, board the VBT shuttle for a short ride to Holašovice. This uniquely preserved village is a UNESCO World Heritage Site because of its typical Baroque farm houses. After exploring the village, begin cycling through a beautiful and protected landscape to Plav, a tranquil Czech village on the banks of a small river. If you like, ride the VBT shuttle to avoid pedaling the few small hills this morning. 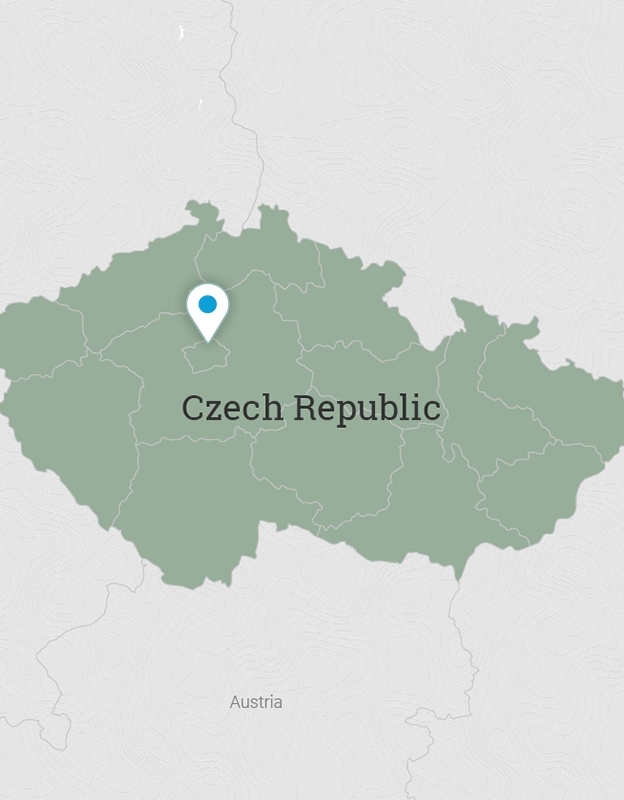 Lunch today is hosted by a local family, allowing you to get a real feel for Czech daily life. Return to the hotel with the shuttle, allowing more time to explore the city center or enjoy additional bicycling on a longer optional ride this afternoon. In addition to strolling Cesky Krumlov’s narrow cobbled streets and enjoying its outdoor cafés, you may choose to visit the town’s gem, the Rosemberg family chateau, dating to 1240. In the evening, find a cozy restaurant where you may enjoy dinner on your own. In the morning, shuttle to the Sumava National Park, the largest national park in the Czech Republic. You’ll start your ride in Cerná v Pošumaví, not far from the German border. An exhilarating bike ride takes you from lakeside scenery through a beautiful forest, far from traffic and villages. At Nove Udoli, you’ll walk into Germany. This unique border crossing was closed in 1945 and reopened some time ago for pedestrians and bicycles only. Your first Bavarian reel follows a downhill stretch of a former railway track. Bavaria is among Europe’s most beautiful and serene cycling areas. On your way, stop at a beer garden for a typical lunch, prepared by the owner-family. Continue cycling to Waldkirchen, where you then shuttle to the historic Baroque city of Passau, situated at the confluence of three rivers: the Danube, the Inn and the Ilz. Tonight, enjoy dinner at the hotel restaurant, overlooking the romantic Danube River. Enjoy a leisurely cycle along the River Inn, the frontier between Germany and Austria. Start by following the German bike route. At Neuhaus, cross the river to the Austrian town of Schärding with its colorful, Baroque-style burgher houses on two town squares. After exploring Schärding, return to Passau. En route, stop for a delicious picnic lunch on the river’s opposite bank, where the Neuburg fortress looms. Use the rest of the afternoon to explore Passau and shop the flea market and antique shops. You might choose to visit magnificent St. Stephen’s Cathedral. Dinner is on your own tonight; you’ll find that Passau offers many dining choices. Begin cycling at Schlögen and head toward Aschach through a beautiful forest, where you stop for lunch on your own. Follow the Danube bike route to Ottensheim, renowned for its hilltop castle, where you conclude your ride. Here, you’ll transfer by private coach to your hotel at Weissenkirchen, in Austria’s Wachau Valley wine region. 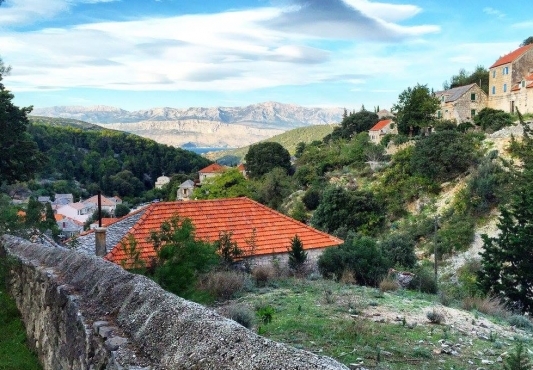 This charming village is dominated by St. Michael’s Church, which dates to 987. There are also many Renaissance buildings with romantic inner courtyards. One of them houses your inviting family-run hotel. Many of Weissenkirchen’s vinegut (winemakers) and wine cellars are located in beautiful, ancient manor houses. Perhaps you’ll savor a famous young heuriger wine in one of these taverns during dinner at your leisure tonight. 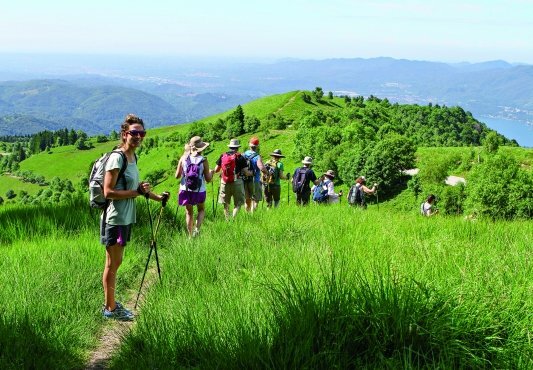 In the morning, cycle through the Wachau Valley, a UNESCO World Heritage Site, to Melk. The Wachau is one of Austria’s most striking landscapes, featuring a mix of hillside orchards and vineyards among ruined castles, abbeys and churches. In Melk, you may want to visit the spectacular Benedictine Abbey, one of Europe’s largest Baroque monasteries. Eat lunch on your own here, before cycling along the Danube to the lovely village of Spitz. From Spitz, cycle back to Weissenkirchen and maybe opt to continue farther to Dürnstein, where Richard the Lionhearted was kept prisoner in 1193. Tonight’s farewell dinner is in a local restaurant within a private, ancient winepress room. After breakfast, transfer to Vienna, arriving at approximately 10:30 a.m.
VBT Air Package & Post Trip Extension guests: Your room at Hotel Stefanie may not be available until 1:00 p.m., but you can leave your luggage with the reception desk. 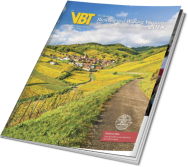 VBT provides City Information, including recommendations for cafés, restaurants, museums and transportation. The rest of the day is free for you to explore Vienna. Your hotel is located near the historic “Inner Ring” in the Old Town; many of the Old World palaces and concert halls are easily accessible. After breakfast*, transfer to the Vienna airport (approximately 30 minutes) for your departing flight**. Please ensure that you are ready in the hotel reception area at the designated time. VBT-Bicycle-Vacation-only guests: Your tour ends at the Hotel Stefanie in Vienna. Important: Train departures from Vienna prior to 11:00 a.m. are not recommended. If you depart earlier, you are responsible for your own transfer arrangements from the hotel in Weissenkirchen. A taxi ride from the Hotel Stefanie to the Vienna train station costs approximately €15/$25 USD and takes approximately 20 minutes. A taxi ride to the Vienna airport costs approximately €30/$50 USD and takes approximately 40 minutes. A cluster of three buildings—including two newly renovated 16th-century structures—the family-run Kirchenwirt Weissenkirchen offers modern comforts in a cozy atmosphere. Each building features its own unique style and beautiful appointments, such as cross vaults, high wooden ceilings and solid wood furniture. Enjoy regional specialties prepared from fresh local ingredients in the restaurant. Some rooms also offer Danube views. Boasting more than 400 years of hospitality, the Hotel Stefanie is the oldest hotel in Vienna and also one of the most beautiful. Named after the wife of Crown Prince Rudolph, Princess Stefanie, the hotel blends modern comfort with traditional charm. Its superior location—near the Danube River on Taborstrasse, the main road into the very heart of the city—puts you close to such notable sights as St. Stephens Cathedral, making it a great location from which to discover the city on foot. An area full of restaurants and shops is also nearby. Should you wish to venture farther afield, the hotel is well served by city transportation. An Internet connection is available in the hotel lobby and in your room. The Altstadt Hotel is located in a quiet quarter of Passau, on the banks where the Danube, Inn and Ilz rivers meet. From its terrace, bar and restaurant, guests can enjoy a wonderful view of the river and castle overlooking the water. The hotel is located in an ancient German building, and it exudes a warm, family character in an intimate atmosphere. The rooms are quite spacious with a modern touch. An Internet connection is available in the hotel lobby and in your room. Situated in the pedestrian center of the UNESCO World Heritage-protected town of Cesky Krumlov, the four-star Hotel Bellevue occupies a meticulously renovated 16th-century building. The hotel features an outdoor terrace, a restaurant with French-inspired cuisine, wine cellar, inviting public spaces and guest rooms decorated with light colors and classic furnishings. An onsite sauna is available, as well as massage services (to be reserved and paid locally). Explore Prague’s unsurpassed culture and history. You may wish to visit Prague Castle, the city’s most popular site. 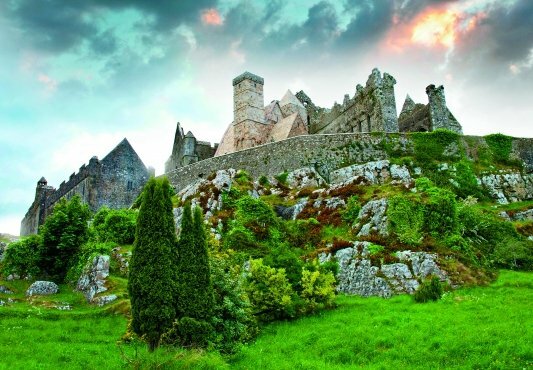 Originally constructed during the ninth century, the castle has been expanded over the centuries from a wooden fortress surrounded by earthen bulwarks into an imposing citadel. Today, spread over 18 acres (7 hectares), it is the largest ancient castle in the world, averaging 1,870 feet (570 meters) long and 420 feet (128 meters) wide. Among its fascinating mix of architectural styles is a classical Baroque façade dating to the 18th-century reign of Maria Theresa. Also well worth a visit is the Jewish Quarter of Josefov, named after the Emperor Josef II, whose reforms helped to ease living conditions there. Located in the Old Town, the Jewish Quarter includes the remains of Prague’s former Jewish ghetto. Since many Jewish people died during World War II or were forced by the Communist regime to leave the country, the current Jewish community in Prague numbers only 5,000 to 6,000 people. First recorded as early as 1091, the Old Town is the oldest of Prague’s quarters. Its center, the Old Town Square, is dominated by the Gothic-style Church of Our Lady Before Tyn and the Town Hall. You might also wish to explore the “New” Town, founded in the 14th century. Spend another day enjoying Prague. Vienna is famous for its museums. You may want to start your discovery of the city at some of the best. The Secession Building is renowned for its architectural design as well as for its Art Nouveau collections. The Kunsthistorisches, rated one of Europe’s finest art museums, has a superb collection of Rubens, along with a large collection of works by Pieter Brueghel the Elder. In the evening, enjoy dinner on your own in one of the city’s many fine restaurants. Today, continue your exploration of the city, perhaps visiting the Spanish Riding School of Vienna. The school trains both horses and riders according to centuries-old methods and is famous for its Lipizzaner horses. Or spend the afternoon at the Hofburg Imperial Palace. Built in 1279, it remains an impressive tribute to the Habsburgs’ great power and wealth. Today, it houses the offices of the Austrian president, the chapel where the Vienna Boys’ Choir performs, and the hall where the Spanish Riding School’s Lipizzaner stallions amaze their audiences. Another notable sight is St. Stephen’s Cathedral, renowned for its Gothic stonework and the largest bell in Austria. The Schönbrunn Palace Gardens offer symmetrical paths and manicured trees. Be certain to shop at the Nachsmarkt—Austria’s largest and grandest open-air market. If you’ve already explored the urban charms of Vienna, head for the rolling hills and trails of the Wienerwald or the Prater woods. Beethoven used the Viennese woods for inspiration and often strolled through them while composing music in his head. Strauss also incorporated the woods and their charms into his music. The delightful woods of Vienna are within easy reach of the city. After breakfast* this morning, transfer to the Vienna airport (approximately 30 minutes) for your departing flight**. Please ensure you are waiting in the hotel reception area at the designated transfer time.